Kelvin Claney, CEO, Chairman and Founder of ICTV Brands stated, “I see this as a first step to bring the DermaWand Spa footprint to multiple high traffic retail locations across America. ICTV Brands, Inc. (OTCQX: ICTV), (CSE: ITV), a direct response marketing and branding company focused on the health, wellness and beauty sector is pleased to announce the upcoming launch of two Spa locations in the greater Philadelphia and Los Angeles areas. The first “Pop-up“ DermaWand Spa will launch November 1st in a high traffic flow area in the King of Prussia Mall, just outside of Philadelphia. The high visibility location will feature illuminated displays and HD monitors playing short video segments featuring ICTV’s products. The site will be staffed by trained professionals, giving shoppers the opportunity to stop for free demonstrations of ICTV’s products before purchasing them. 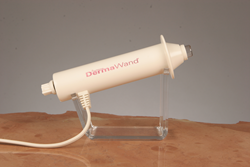 Initially DermaWand Spa will feature DermaWand, DermaVital, Derma Brilliance and Jidue, but as we bring new brands to market they will be added to the DermaWand Spa product line-up. A second DermaWand Spa launch is also planned for early November at Westfield Fashion Square, Sherman Oaks, California and will operate under the same format. Having spent $25 million dollars on DRTV advertising, creating brand awareness for DermaWand, ICTV sees the “pop-up” spa model as a fast, flexible and cost effective way to create new streams of income by bringing our known brands to the retail shopper in an interactive and demonstrable manner. The company will not only initiate sales to new customers, but also gain valuable information such as new customer email addresses and profiles. ICTV has contracted with JBC & Associates Inc. one of the largest organizers of casual leasing space for major US malls and if these first two locations are successful, it is ICTV’s intention, with the assistance of JBC, to rapidly expand the DermaWand Spa outlets into mall and other “pop-up” retail locations. These locations will be determined by implementing the known data showing areas where the Company’s products have sold successfully by DRTV and will therefore be recognizable to shoppers. ICTV Brands, Inc. sells various health, wellness and beauty products through a multi-channel distribution strategy. ICTV utilizes a distinctive marketing strategy and multi-channel distribution model to develop, market and sell products through direct response television (DRTV), Internet/digital, e-commerce, live television shopping and retail. Its products are primarily sold in the U.S. and available in over 60 countries. Its products include DermaWand, a skin care device that reduces the appearance of fine lines and wrinkles, and helps improve skin tone and texture, DermaVital, a professional quality skin care line that effects superior hydration, the CoralActives brand of acne treatment and skin cleansing products, and Derma Brilliance, a sonic exfoliation skin care system which helps reduce visible signs of aging, and Good Planet Super Solution, a multi-use cleaning agent. ICTV Brands, Inc. was founded in 1998 and headquartered in Wayne, Pennsylvania. JBC & Associates are retail marketing specialists providing state of the art direct to consumer mall or store front programs such as Pop-up stores, Kiosks and RMU’s that increases visibility of your products and services, creating the differentiation of your company from your competitors. Forward-Looking Statements. This press release contains "forward-looking statements" within the meaning of Section 27A of the Securities Act of 1933, as amended, and Section 21E of the Securities Exchange Act of 1934, as amended (the "Exchange Act") (which Sections were adopted as part of the Private Securities Litigation Reform Act of 1995). Statements preceded by, followed by or that otherwise include the words "believe," "anticipate," "estimate," "expect," "intend," "plan," "project," "prospects," "outlook," and similar words or expressions, or future or conditional verbs such as "will," "should," "would," "may," and "could" are generally forward-looking in nature and not historical facts. These forward-looking statements involve known and unknown risks, uncertainties and other factors which may cause the Company's actual results, performance or achievements to be materially different from any anticipated results, performance or achievements. The Company disclaims any intention to, and undertakes no obligation to, revise any forward-looking statements, whether as a result of new information, a future event, or otherwise. For additional risks and uncertainties that could impact the Company's forward-looking statements, please see the Company's Annual Report on Form 10-K for the year ended December 31, 2014, including but not limited to the discussion under "Risk Factors" therein, which the Company has filed with the SEC and which may be viewed at http://www.sec.gov.